Once upon a time my husband and I thought we were not "dog people". We liked dogs just fine but when it came right down to it couldn't imagine owning one...cats certainly, we always had a house full, but dogs just weren't in the picture. But then we had three boys and when those boys were old enough they really wanted a dog! The pestering began...and if you have kids you know how that goes. 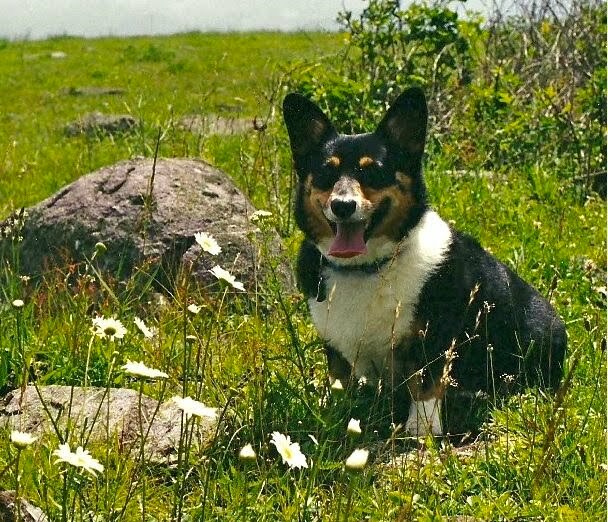 We kept putting them off, but one day a neighbor came to us and asked if we would be interested in taking her 2yr old corgi because she was moving to a much smaller house and with 4 dogs already she just didn't have the room. 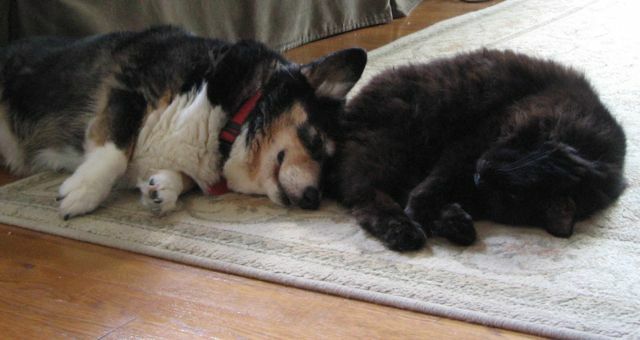 We decided we would try it for a week on a sort of doggie day care basis...Mattie, that's the corgi, would come and spend the day with us and then we would take her home at night. All went well...in fact it went so well that after the second day Mattie simply refused to go back...she had found her home and we had found the perfect dog. Within a week even the husband was saying things like..."who's the prettiest dog?" something I never thought I'd live to see. 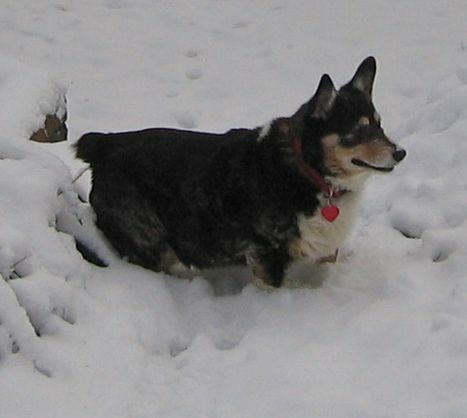 For 13 years she was a constant part of our lives. She went on every trip, kept me company when all the guys were off to school, and was adored by all our cats who considered her an honorary member of their tribe. Her funny bouncing run and the way she loved to dig through snow, how she slept on the AC vents all summer, her wonderful smile...she took over our hearts in the way that only pets can do. 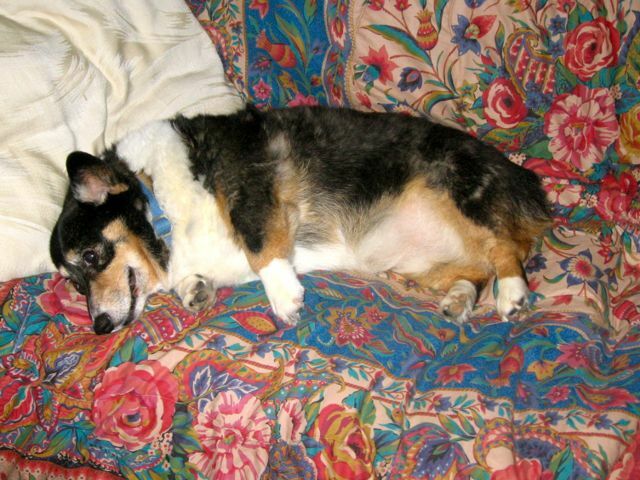 Last Monday, Nov. 22, we had to put our sweet Mattie to sleep. She had gotten progressively weaker and more ill over the previous month until at last she couldn't stand, and we decided it was time. It was so hard. Luckily we have a wonderful vet who comes to our house and she took care of everything so she passed at home surrounded by the people she loved. I don't know if I'll ever have another dog but I'm sure that I had the honor of sharing my life with one of the best dogs ever. This is such a beautiful story. I'm so sorry to hear that Mattie is gone. Pets are like losing a family member when they are so close to us. She had such a wonderful life and a great family to share her life with. I am so very very sorry for your loss, Such a lovely tribute. So sad. I'm glad to have discovered your blog but very sorry to hear of your loss. Thanks for sharing your story. She sounds like a special dog. I'm so sorry for your loss - she looks like she was an awesome dog. so sorry to hear about your loss of mattie~we lost cody back in january. they never leave our hearts however.